You’ve might have seen this zeitgeisty question in your social media feed, especially at the end of April, when Fashion Revolution, an international week of fashion activism, rolls around. Founded to commemorate the shocking collapse of the Rana Plaza garment factory in Bangladesh in 2013, in which 1,138 (mostly female) garment workers were killed, Fashion Revolution has made it cool to give a damn about the people who stitch your clothes together. But there’s another fashion crisis unfolding, albeit more slowly. And it’s not in your closet. It’s in your jewelry box. You probably thought that mines were mainly worked by yellow earth movers and men in hard hats surveying the mile-wide hole they’ve punched into the ground in South Africa. But in actuality, 90 percent of the global mining workforce is actually small-scale, a.k.a. “artisanal” miners. And roughly one-third of the 15 million small-scale miners worldwide in more than 73 countries––from Peru to Mongolia and Zambia––are women, who bring their children along either because they lack childcare or the children also actively work the mine. Artisanal, is a funny word for this shadow mineral economy, even though that’s the word that the U.N. and jewelry industry uses to describe it. For the conscious consumer, it brings to mind locally-made quince jam. But in the context of gold, it means individual miners who mine by hand in a largely unregulated environment. It is technically “sourced by hand,” which is dangerous process but when it comes to getting precious metals and stones out of the earth. The workplace fatality rate for artisanal mines is up to 90 times higher than in industrial production. Not 90 percent higher, a multiple of 90. In 1998, a mudslide in Colombia killed 100 gemstone miners. Zimbabwe’s mining community has a reputation for death by collapse because miners frequently re-enter closed gold mines, or burrow into uncompacted river banks. With artisanal mining growing by 20 percent a year in many developing countries, it’s a chaotic gold rush, literally. Including suffering injury and death from collapsing mines, small-scale miners also are at risk for silicosis from breathing in pulverized rock, and illnesses from living in cramped, unhygienic shanty towns thrown up by the muddy side of mines. The biggest problem is that, since the miners are doing their own mining independently and selling to middlemen instead of working for a company, they receive no safety training and inadequate equipment. Miners often process raw materials in their home, contaminating their meager water supply with mercury and cyanide and breathing in toxic dust and fumes. In Ghana, women and children as young as 14 have advanced stages of silicosis from grinding gold-bearing ore in their home. What has made the United Nations pay attention is that more than 99 percent of gold mined around the world—industrial included—is obtained using the neurotoxin mercury. Mercury vapors travel long distances, persist in the environment, enter food sources, and bio-accumulate in animals and humans. Symptoms after inhaling mercury include tremors, insomnia, memory loss, neuromuscular effects, headaches and cognitive and motor dysfunction, plus kidney failure, and even death. Experts agree that there is no safe level of exposure to mercury. In small-scale mines, miners use mercury, a shallow pan, a bit of water, and their bare hands to separate the gold from the ore. Releasing approximately 400 metric tons of airborne elemental mercury each year, artisanal gold mining contributes about a fourth of all the global mercury use and emissions, making it the leading sector for mercury emissions. There is a veritable epidemic of mercury poisoning going on. Of course, small-scale miners typically lack access to health care, so it’s impossible to know the full extent of silicosis and mercury poisoning of women and children due to gold, silver, and gemstone mining. Many developing countries, seeing this slow-moving disaster, have attempted to stamp out artisanal mining, with little success. Small-scale mining is often the only way for the rural poor to earn an income and support themselves, especially in place like Mongolia, where climate change and extreme weather events are making it near impossible for nomads to eke out a living on their traditional land. We probably don’t need to tell you about blood diamonds, so named because they finance bloody conflicts in African countries like Angola, the Democratic Republic of Congo, and Sierra Leone. But a new type of conflict gem has emerged: the genocide gem. The sale of rubies and sapphires from military-linked mining businesses in Myanmar (formerly known as Burma) has helped finance the shocking ongoing genocide against the Rohingya minority. Plot twist: many of those Rohingya women are fleeing into neighboring Bangladesh and taking up those exploitative jobs in garment factories. So we come full circle. The good news is that it’s easier to shop mindfully for ethical jewelry than for ethical clothing. The issues are simpler and easier to understand, from the consumer perspective. And fine jewelry is also the type of fashion purchase that we naturally take more time to carefully consider because of the prices. 1. Look for certified Fairmined Ecological gold. Many conscious jewelers such as Melissa Joy Manning, Bario Neal, Mociun, and Monique Péan have turned to recycled gold in order to keep their jewelry clean and ethical. However, even if we recycled all the bits of gold in old electronics and got people to turn in every bit of gold jewelry that they weren’t sentimentally attached to, that would probably satisfy no more than half of the world’s demand for gold. And as we pointed out above, artisanal gold mining is not going away, so a better solution is to demand better standards for these miners, by asking for gold that is mined safely and cleanly. The FAIRMINED Association certifies mines who are socially and environmentally responsible, with no child labor. The miners get a guaranteed fair price, plus an additional premium to invest in proper training and equipment, social development, and environmental protection. The Fairmined Ecological certification goes a step above, guaranteeing that no mercury or cyanide was used at the mine, and even requires that the mine rehabilitate local ecosystems. There are several jewelers that use some Fairmined gold, and many jewelry houses that supported the initiative financially, but Futura is the only one luxury jeweler dedicated to only using nothing but Fairmined Ecological gold. Their jewelry is crafted from pure 18 carat Ecological gold sourced from the only certified mine in the world in Mongolia. 2. Ask the jeweler where the stones are from. It’s not common that jewelers know the answer to this, but that’s mainly because customers aren’t asking yet. So do ask. Even if it’s a less expensive crystal, those can also come from conflict regions like the Democratic Republic of Congo and Myanmar. (Countries with strong regulations are Canada, Finland, Argentina, Botswana, Spain, and the Philippines.) The jeweler might say they got it in Arizona at the Tucson Gem, Mineral, and Fossil showcase, but don’t let that be their final answer. 3. Go above and beyond the Kimberley Process for diamonds. The Kimberley Process, which was created by the United Nations General Assembly Resolution in order to prevent conflict diamonds from entering the market, has come under quite a bit of fire after proving itself less than effective. So the most ethical jewelers consider Kimberley certification just a start, and will work directly with ethical mining communities to source their stones, in the case of Linhartd in New York, or demand additional certifications and assurances from their suppliers, as in Ella Stein. This process is not foolproof, however. 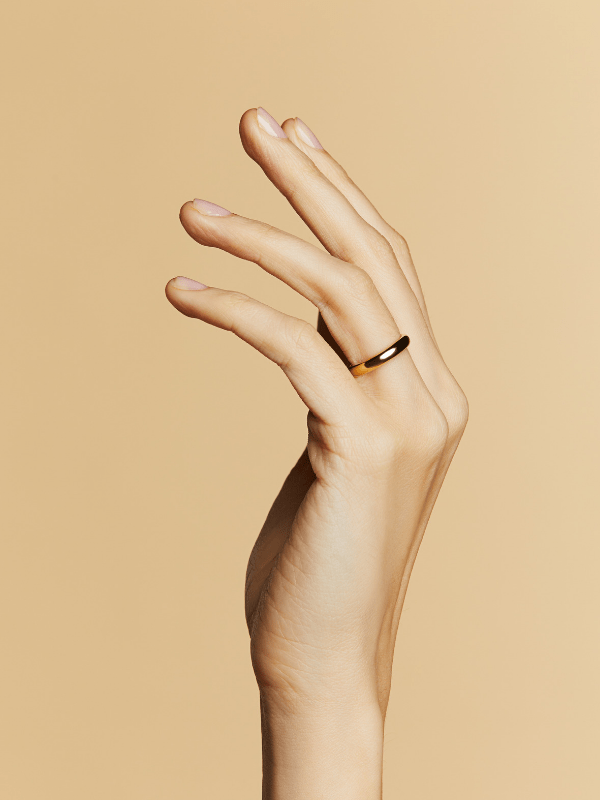 The ethical engagement ring powerhouse Brilliant Earth was outed last year for mislabeling their supposedly conflict-free diamonds and other sorts of shady business. 4. Better yet, choose lab-grown diamonds. You won’t hear this from most women’s fashion magazines because their advertisers lean very hard on editorial to pretend they don’t exist. But lab-grown diamonds are the only way to 100 percent ensure that your diamonds are conflict-free and don’t cause any damage to the environment. We recommend them. 5. Ask where the jewelry pieces are crafted. We often see jewelry companies bragging that their jewelry is “designed in New York.” Well, yes, most fashion from American brands is “designed in New York.” The real question is: where is it made? Jewelry workshops, if not properly regulated, can be extremely dangerous. Open flames, various chemicals, power tools, and fumes all contribute to a workspace that can cause serious accidents or long-term health problems. So it’s best if the jewelry was crafted in a country with excellent workplace regulations, such as the U.S., Canada, or Europe, or the jeweler has personally visited the jewelry-making workshop to verify that it is well-ventilated and has safety precautions in place. 5 Tips on How To Buy Less, When You Love More. That will improve your style, savings, and the planet. How Does the Fashion Industry Waste Water? And 5 ways you can help.